Hayling Island was the first venue in this year’s Moth Grand Prix Series and, with the Worlds being held there next year, the best of the best attended, even recently crowned 49er European Champion Dylan Fletcher, as no one was going to miss the chance to test out the waters of Hayling Island Sailing Club. Unfortunately the only thing that couldn’t be changed was the weather. The 27 strong fleet was held ashore for an hour on Saturday while competitors waited for the wind to kick in. Eventually the breeze set in at 8 to 10 knots and Ricky Tagg led the fleet out to the race course. Slowly the fleet started to follow him, but a large black cloud appeared and the wind increased to 25 knots which made for some great downwind legs across the Bar, but for some the wind was too great and the fleet was sent back to the safety of the Harbour. Once everyone was safely ashore the PRO took the decision to race in the Harbour, but by the time the fleet got out to the line the wind had once again switched off. After racing there was a debrief session held by Peter Barton, who was the on water coach on Saturday. There waas discussion about the models and what gear does as the wind and waves increases. The session proved very useful for the newbies and also for many of the top guys. There was also a question and answer season on the Worlds in 2014 led by Mike Lennon where most of the sailors' views and concerns were put to rest. The World’s subcommittee are already well prepared. The fleet then sat down for an evening meal and hit the bar, but all good things must come to an end and the remaining Moth fleet eventually left the club at midnight. The fleet rose on Sunday to a stiff breeze of 18 to 20 knots and although the race course was fine for racing, the journey across the Bar was looking a little bit interesting, so the fleet was once again held ashore to allow the tide to come in. After an hour the Bar was still looking too lumpy and the fleet drew straws to find some crash test dummies! This saw James Phare and Doug Pybus hit the water James in a Ninja and Doug in a Ninja bow sprit conversion. Ricky Tagg and Gareth Davies went in the safety RIB to ensure James and Doug made it to the course and back again safely. Race 1 got away well with Mike Lennon, using a new Hyde sail, rounding first with quite a comfortable distance, but a motor boat had just passed the spacer mark which caused him to capsize thanks to the wake. The top mark had been placed in an area where the tides meet. This led to some big waves and tested the skills of the fleet in the chop claiming many casualties. Chris Rashley took the first win of the day with Rob Greenhalgh 2nd and Mike Lennon 3rd. Fourth was taken by Ben Paton, who appeared to have found some extra speed this weekend but, pushed a little too hard at times which lead to a visit in the tide. Race 2 saw a familiar pattern which could not be said about the wave formation at the windward mark. Chris led again, but this time Mike Lennon was to take the second. Dylan Fletcher was in the mix as well until lap two when a couple of capsizes at the windward mark caused him to let the fleet past. This put Rob Greenhalgh 3rd, Ben Paton came home in 4th place and Gareth Davies 5th. For Race 3 the tide had turned, pushing the fleet over the line. This caught out Mike Lennon and Kyle Stoneham, both OCS. Although the tide had turned, the top mark was still a little bit interesting which even saw Rob Greenhalgh take a dip. The key seemed to be to gybe off early and get in to the shallows where it flattened off a bit, but this was easier said than done, picking the right wave to gybe is an art in itself. This did not stop runaway leader Chris Rashley from once again taking the win, with Tom Offer in 2nd place, Rob Greenhalgh 3rd, with James Phare in his Ninja 4th and Gareth Davies 5th again. Then fleet then headed ashore, most smiling and with tales to tell about their bear away at the windward mark. 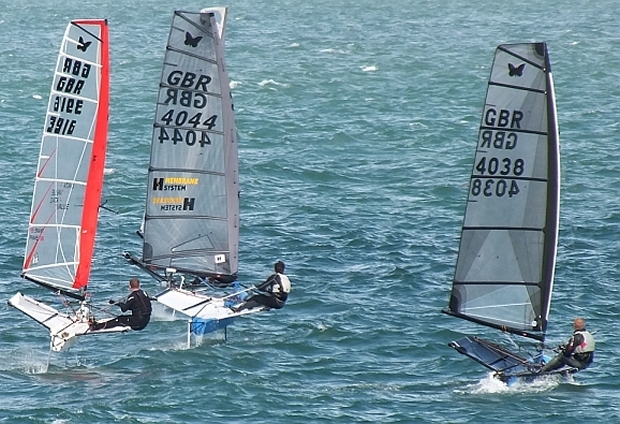 Hayling Island SC is set to provide a well organised venue for the Worlds in 2014 and it will produce a World Champion who will really have earned his crown in testing conditions.